Last week, 10 inspiring ex-carers were professionally trained to become coaches for current carers of people with progressive illnesses. The training took place over three days at St Christopher’s Hospice in Sydenham with the support of Animas coaching company and Innovation Unit, a not for profit organisation who helped create the model. 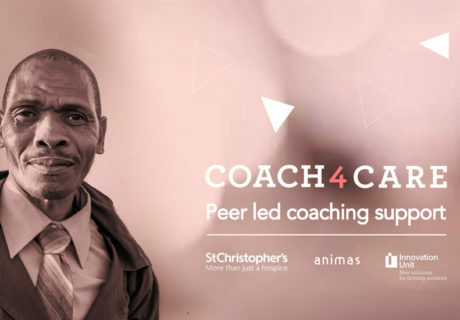 The idea for Coach4Care was designed by carers for carers in a year long research project at St Christopher’s Hospice exploring what would help carers looking after people with progressive illnesses and diseases as part of a programme called Better Endings. Carers told us that they valued peer support, but wanted it done in a way that would help them reflect on their experiences and take positive action to improve their situation, for themselves and their loved ones. Out of this Coach4Care was born; flexible peer-led support that helps carers reflect on, manage and improve day to day life, increase their overall wellbeing and sense of control. The model was created and tested by carers themselves who said it was just what they needed. Coach4Care recognises that caregivers are the experts of their own experiences and that they learn best from reflecting on their experiences, rather than being told what to do. The coach’s role is not to have all of the answers, but to support carers to arrive at their own solutions to challenges. Our ex-carers have been professionally trained with cutting edge coaching tools to listen and guide, not to give advice. They are now ready and equipped to offer free flexible coaching sessions in Lewisham to carers of people with progressive illnesses to share these empowering tools. The beauty of these tools is that they can be used to help in your caring role, and in life more generally. Carers will receive free one hour coaching sessions every fortnight, at a time and place that suits them either face-to-face or over the phone. They will also be given the Coach4Care handbook, and join the Coach4Care community where you will have access to social events and organised talks for carers involved in the project.